Liverpool City Council is continuing its bid to clean up areas of the city, with a huge push on recycling being the latest development. As of March 6th, the local council is to roll out larger 90 litre reusable recycling sacks to eligible areas such as Kensington and Fairfield. These bags will replace the current 55 litre boxes that are currently being used by up to 26,000 homes across Merseyside. The Assistant Mayor of Liverpool, Councillor Nick Small, said: “As a local councillor for the Central Ward, I very much want to see the recycling increase across the city. In areas like Kensington Fields, where there are four-foot Victorian alleyways, it’s very difficult to deliver a wheeled bin service. The crackdown is a branch-off from an earlier campaign – Kenny Fields Fights Waste – which has been running for a number of years in the area. Events are coordinated to encourage residents to be more conscious of their waste, in whatever form that may be, including clothing swaps and regular meetings at the community centre. 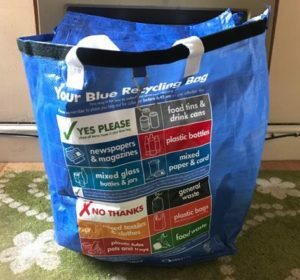 Central Ward Councillor Christine Banks said: “The new recycling bags will promote this incentive to recycle and also make it easier to do so. This reduces residual waste that goes out in black bin bags and causes fewer problems. A successful pilot scheme of these sacks was launched in Liverpool’s County Ward towards the end of 2016 and drove up the amount of recyclable waste collected by almost 20 percent. In the coming months, there are plans to expand the current collection services run by the council to a regular week-by-week basis for Kensington’s terraced properties. This will also extend out to cover 5,500 city-centre apartment blocks, where an estimated 114 tonnes of recyclable waste is wrongly disposed every year due to the current lower collection rates.